While I pursued other artistic careers, in film scriptwriting, photography and graphic design, sculpture has always travelled with me, a touchstone that’s kept me grounded, an ancient art form that created a meditative space from which to escape the turbulence of the modern world. It wasn’t until an evening pottery class, when my wheel-thrown pots began morphing into abstract human forms, that I decided it was time to ‘scratch the itch’. I took numerous evening sculpture classes, weekend workshops and TAFE courses, and with mentoring and encouragement from some fantastic teachers and artists, I finally set up my own sculpture studio – and finally found my ‘place’! 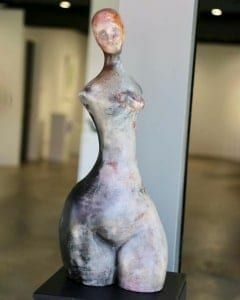 I’m most interested in the human form, in exploring the reduction of a figure to its simplest sculptural form. My graphic design training has guided my style, where simplicity, clean lines and balanced negative space are of prime importance. People’s relationships, with each other and the world, form the basis for most of my work. The parent and child are my favourite subject, emanating from my experience of raising four fabulous children. Their childhoods bubble up constantly in my mind and re-surface under my fingers. But I also love balance. The engineering challenge of defying gravity, and the movement and tension that this generates – this is what excites me. 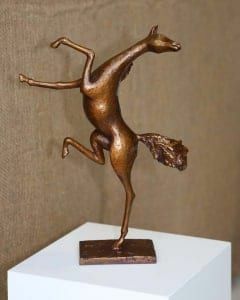 Often these pieces turn to whimsy as their jumping off point – I like to challenge reality as well as gravity! I like to explore the quirky, question the conventional, create a happy space for the viewer to contemplate the world from outside the box. Texture is another passion. Apart from creating energy and highlighting the form, texture can be a statement of ‘made by hand’, an important concept in a world drowning in mass-produced goods. I use oxides to bring up the texture, or use a textured patina on smooth pieces. Individuality is important – all my ceramic pieces are one-off originals while my metal sculptures are either unique one-offs using the “lost wax” process or a limited edition of ten*. Amanda has exhibited widely, been accepted into numerous competitions and has won many prizes. 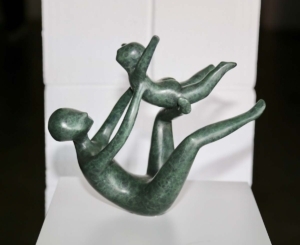 In just the last 2 years she has won 1st prize in Figurative Sculpture at the Sydney Royal Arts, the Ewart Art Prize, Northbridge Art Prize and the Sculptors Society Annual Awards. She has also won People’s Choice Awards at Bowral Sculpture Show 2018, Sculpture on Clyde 2017, Sculpture in the Valley 2017, Sculpture Bermagui 2017, Northern Beaches [Warringah] Art Prize and the Sydney Teapot Show. 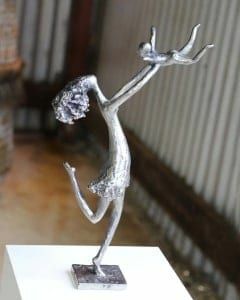 Amanda is a member of the Sculptors Society, the Australian Ceramics Association and the Workshop Arts Centre, and is co-convenor and marketing manager for the popular Greenwich Village Arts Trail, held annually on the first weekend in November in northern Sydney.